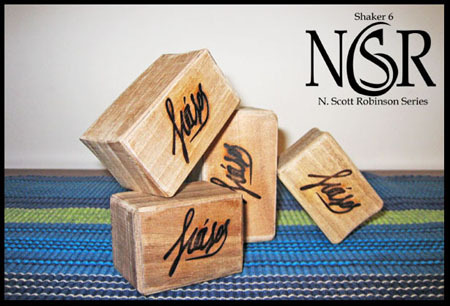 A specifally designed handmade walnut multi-timbral shaker for N. Scott Robinson by Siasos Drums. The Shaker 6 is made from thin pieces of Greek walnut with each of the 6 sides a different thickness. Each Shaker 6 is filled with metal shot with no 2 instruments sounding the same. The Shaker 6 produces a multitude of timbres depending on which of the 6 sides faces forward while playing. Other timbres can be produced by holding the Shaker 6 at an angle so the shot strikes 2 surfaces. Closing the hand around the Shaker 6 while playing will yield muted timbres. Rotating the Shaker 6 while playing is another technique that will vary the timbres.